This essay discusses whether place is a defined space. It begins with Henri Lefebvre’s concept of the abstraction of space from absolute space and determines how current landscape strategy facilitates this abstraction. In the abstraction and organisation of space, space and law are bound to each other. It questions that if movement is commanded by space, can space be read? The dissertation also discusses an object’s ‘technological aura‘, or ‘extended presence’, and questions how this presence effects an individual’s movement in space and perception of time. It also discusses the temporal aspects of place and concludes whether place is a defined space. This essay discusses whether place is a defined space. When considering how space can be defined one has to consider what happens in space. Section 2 questions the process of the abstraction of space and the relation space has with its activities and resultant boundaries. The organisation of space and its networks are discussed in the context of the current landscape strategy. In the third section the relation between space and the maintenance of social order is explored. In the context of Jeremy Bentham’s Panapticon, the influence of CCTV and other telecommunication devices and their effect upon an individual’s behavior is discussed. It is suggested that aura, when viewed in the light of modern technology, is an extended presence and it is explored whether mental space is becoming increasingly affected and defined by the extended presence of this technology. If place is a defined space the traces and temporal aspects of space must also be considered. In section four these are discussed together with the disappearance of the intimate connection between body and time. When considering the above only then can it be concluded if place is a defined space. The term ‘space’ is abstract but not empty. Abstract space extends in all directions; outwards to all regions of the globe and inwards to the inner reaches of the mind. Each space that Ingold describes is a specific space that has a boundary and encompasses an activity. These are also places. Different environments, landscape, indoors and outdoors are all places as well as types of spaces. Would it be fair, therefore, to say that place is a defined space? Is a place defined by the events and activities that occur with its resultant boundary? What is the relation between a boundary and the activities it encompasses? In defining ‘space as a practised place’, Michel de Certeau recognises the relation between function and bounded space when he writes, ‘There is no spatiality that is not organised by the determination of its frontiers. This organisation of space applies to all spaces whether natural or manmade’. Henri Lefebvre refers to types of boundaries that spaces have in relation to their type of use. He summarises these as accessible spaces for normal use that have established rules and practical procedures, bounded and forbidden territories, places of abode and junctions points. Practically, it is the organisation of these spaces that creates their boundaries. When discussing the organisation of space the appropriate place to start is with the body since the fundamental principles of spatial organisation lay in its size, posture and structure. The abstraction of space is also relative to the body, according to Maurice Merleau-Ponty, who writes that physical space is related to the body in space, whereas the body marking out a trace in space is concerned with the interchangeable dimensions of geometrical space. It is the intimate connection between biological needs and social relations that Lefebvre refers to as absolute space. Absolute space existed as fragments of nature in a time when people were intimately bound up with that space. He argues that where once there was ‘absolute space’, now there is ‘abstract space’. The body also exists biologically as a result of processes and the space beyond it. First and foremost to exist the body needs to secure necessary linkages to the world and with other individuals for sources of sunlight, water and food. Yi Fu-Tuan writes, ‘Man, out of his intimate experience with his body and with other people, organises space so that it conforms with and caters to his biological needs and social relations’. Due to its organisation and those intimate direct bonds weakening and disappearing, absolute space has become abstracted. It can be said that humans have abstracted their relationship with space. But, how can the abstraction of space be discussed in terms that Ingold will recognise? Well, if the abstraction of space is its organisation to create place than one method is to look at the underlying strategy behind the abstraction of space in the creation and organisation of different places. Paul Shepherd writes ‘Landscape is the overview; the strategy. There are buildings in the middle; tactics. There are machines at the close: operations’. A strategy lies behind every action and it is the strategy of landscape that is the prerequisite of all architectural and infrastructural action. Planned by governments and influenced by large corporations the current landscape strategy is the economic exploitation of the earth, a continuation and geographical expansion of the nineteenth century landscape strategy of industrial exploitation. Tactics, undertaken by architects and engineers, are defined by Shepherd as the ‘design and positioning of parts ready for the implementation of the strategy’. The operations, undertaken by persons such as builders, plumbers and electricians, carry through the tactics. Concretely, in the everyday geography more familiar to us, they correspond to routes, axes, or paths that lead from one place to another and have been traced by people; to crossroads and open spaces where people pass, meet and gather, and which sometimes are made very large to satisfy the needs of economic exchange; and lastly, to centres of more or less monumental type, religious or political, constructed by certain men and therefore defining a space and frontiers beyond which other men are defined as others, in relation with other centres and other spaces. The organisational factors that Augé has included are ones of territoriality and defining self-identity. However, in the service of global capitalism priority has moved away from the social spaces of people and the identity by which groups of people are known. Lefebvre writes, ‘Thus social space emerged from the earth and evolved […] until an abstract space was constructed, a geometric, visual and phallic space that went beyond spatiality […] the medium of the state, of power and its strategies’. Thus, authentic public space is rapidly disappearing as it becomes increasingly consumed by the spaces of capitalism. These spaces are the spaces of circulation, consumption and communication that multiply and extend across the globe. The current abstraction of space and its organisation is influenced by computer software. Flowcharts and swim diagrams that represent internal and external processes and the processes of the client are translated into real places that resemble flowcharts and swim diagrams. Spreadsheets that contain product quantities create spaces that resemble spreadsheets. All software has built-in guidelines and formats to promote a consistency of use and using these consistent methods of town-planning and architectural design, spaces are becoming increasingly similar and go beyond the geometric to become diagrammatic. Where logistics programming has been translated into a logistical space is Jebel Ali, the Dubai Logistics City (DLC), currently being constructed in the United Arab Emirates (UAE). To provide sea-to-air and air-to-air passenger and cargo services it was designed from the outset to be a site that deals with all aspects of global logistics. DLC is a diagrammatical space and is designed, operated and networked on a number of scales; the global scale that capitalism is organised and its place in the global geographical network, the national scale of UAE’s ideology and an urban scale of experience that includes 21.5 square kilometres of construction, steel containers, factories, administration and networks of supply and demand. In short a landscape strategy where networks and communications transcend scale in the implementation of tactics and operations. As Doreen Massey writes, ‘Space itself is the ‘product of interrelations, as constituted through interactions, from the global to the intimate.’ Whether it is place or a non-place that has been created and defined, a place cannot exist in isolation. It can only exist in connection with, or separated from, other spaces. In addition to place Marc Augé has defined ‘non-place’, ‘If a place can be defined as relational, historical and concerned with identity, then a space which cannot be defined as relational, or historical, or concerned with identity will be a non-place’. The relational that Augé refers to is the relation of place to the space where it is situated and whether it has has a sense of belonging to that space. According to Augé, the fundamental premise of non-place is whether the user is in contractual relations with the powers that govern it. It would also, therefore, be correct to say that non-place does not directly address social needs but addresses the individual only in their capacity as a consumer. Place and non-place may exist as theoretical constructs but their recognition is vital beyond academic circles since an increase in non-public places is proportional to the degradation of basic human biological and societal needs. Whilst non-place is not the void of place or its opposite it can be recognised as not public. To maintain the well-being of a society, parks, playing fields and other truly public spaces must be kept. As Massey argues, it is the ‘vesting of control over such spaces in the hands of non-democratically elected owners involves the exclusion from many individuals who wish to be there’. Yet, it must be remembered that for offences such as loitering individuals may also be excluded from public places as well. Before producing effects in the material realm (tools and objects), before producing itself by drawing nourishment from that realm, and before reproducing itself by generating other bodies, each living body is space and has its space, it produces itself in space, and it also produces that space. Space commands bodies, prescribing or proscribing gestures, routes and distances to be covered. It is produced with this purpose in mind; this is its raison d’etre. The reading of space is merely a secondary and practically irrelevant upshot, a rather superfluous reward to the individual for blind, spontaneous and lived obedience. Is it in the command of space before our reading of it that maintains its security? Maurice Merleau-Ponty writes that the ‘world is always ‘already there’ before reflection [or reading] begins’.An individual’s obedience is blind since the ‘already there’ takes place in a world where space already commands. Upon being born into the world and out of their parent’s arms a baby’s behaviour is usually restricted to its rectangular cot. A behaviour where spatial commands are perceived and taught through social relations and the boundaries of the cot itself. Although he doesn’t specify their nature Lefebvre proposes there are special codes embedded into all aspects of the environment. Their main purpose is to maintain a teaching function and to inform or disapprove. Such codes includes the length and layout of our streets and the body’s response to facades of buildings and their basic design features such as enclosure, and exposure, verticality and horizontality, mass and volume. Similar to buildings, there are street furniture and road signs that also instruct and articulate movement and social order. Baron George Haussmann redesigned Paris between 1853 and 1870. With its new parks, open spaces and easier traffic flow he asserted that it was part of a strategy to provide Paris with a healthier environment but by the mid-twentieth century even mainstream voices read the new spaces of their city to be politically motivated by the maintenance of law and order. According to Henri Laurens, ‘He [Haussmann] created roads that were straight and wide, so that the Calvary could more easily charge them down and the regular troops could make use of their long range weapons’. In the 1950s, Paul-Henry Chombart De Lauwe proposed that order is maintained within neighbourheads and larger areas of the Parisian suburbs by directly limiting and controlling pedestrian movementto social, civic and economic centers by use of newly-built infrastructure or appropriating pre-existing infrastructure.This limitation of movement was evident at the London 2012 Olympic Park where the ready-made surrounding infrastructure of trunk roads, canals and elevated railways were appropriated to supervise pedestrian and vehicular movement when accessing and exiting the park. The infrastructure will continue to be utilised for the site’s residential transformation into the Queen Elizabeth Park. However, the boundaries of space can only supervise or command the movement of an individual. It cannot totally influence their behavior. In Britain Closed Circuit Television (CCTV) also affects the behaviour of pedestrians and road users using a premise that originates with eighteenth century English philosopher Jeremy Bentham and his development of the Panapticon. It is worth briefly describing since it also applies to other telecommunication devices. The Panapticon is an architectural system where the inspector could not be seen or heard in his centre, or tower. The physical structure of the Panapticon is described in a series of letters Bentham wrote in 1787: ‘The building is circular. The apartments of the prisoners occupy the circumference…These cells are divided from one another, and the prisoners by that means secluded from all communication with each other […] The apartment of the inspector occupies the centre […] to have a vacant space or area all round, between such centre and such circumference’. The premise of partitioning was to isolate the individual away from the group. This organization involved discipline proceeding from the distribution of individuals where ‘each individual has his own place; and each place its individual’. Bentham wanted the principle of his Panapticon to be applied in seriality as an easily transferable mechanism that would encompass other buildings such as asylums, schools, hospitals and factories. The geometrisation and division of space could also be extended to organizational schema. As Peter Halley writes in the Crisis in Geometry, ‘The time clock, the chart and the graph, by which bodies and their movements could be measured and categorised, emerged as omnipresent techniques in the industrial order’. At the time the Panapticon did not pass through parliament (which may have been due to Bentham’s personal unpopularity) yet 200 years later the same principle of the visible and unverifiable officer has extended to what may include the portable Panapticons in our pockets; these are the telecommunication devices such as smartphones and Blackberries whose spoken and written digital communications may, or may not, be under surveillance but a user’s location is always tracked on GPS. With CCTV and telecommunication devices the equivalent of the ‘visible and unverifiable’ officer in his tower can be identified. But how is the person on the street identified as the inmate in their partitioned cell? In order to minimise the chance of unrest and to maintain order, how can an individual become the ‘object of information never in communication’? The individual, finally, is decentred from himself. He has instruments that place him in constant contact with the remotest parts of the outside world […] The individual can thus live rather oddly in an intellectual, musical or visual environment that is wholly independent of his immediate physical surroundings. How is an individual’s perception altered when they are connected to a device that takes their mind elsewhere? One such explanation is found in object-relations theory where, the self is constructed as a relationship with other objects and the outer world. The outer world is not experienced as external but is absorbed into the self to become part of an individual’s inner life. It could be said that mental space is becoming increasingly more affected by the presence of this technology as it becomes habitually absorbed. In the act of connecting into their musical or visual environment individuals are partitioning themselves away from each other to become objects of information rather than communication unless of course that communication is technological. The trace is appearance of a nearness, however far removed the thing that left it behind. The aura is appearance of a distance; however close the thing that calls it forth. In the trace, we gain possession of the thing; in the aura it takes possession of us. Whilst trace will be discussed a little later, with regards to telecommunications, aura becomes technological and an extended presence beyond the device’s initial space of occupation reaching to a space or object of receivership. The very essence of technological aura is the data traveling as megabits via radio, electricity or light waves. Thus, to read the space of a main road is to also consider the technological aura, or extended presence, of the surveillance camera located within that road, the private control room(s) connected to the camera and those employees who maintain the systems. The ticket machines for parking also extend their presence to a space hosting an attendant whose role it is to monitor the time and payment of the ‘customer.’ Less obvious is the satellite phone that occupies a space in a person’s pocket. Its extended presence depends on how much data it transmits and receives ‘since its creation that can be handed down…’ It extends its presence to those persons they phone via the nearest satellite. In receiving and transmitting signals high above the earth the satellite extends its ‘collective aura’ to thousands of phones on earth. Therefore, all places extend their spaces in two directions, a direction toward the body and mental space and a direction toward increasing scales of the urban, the national and the global. It is, as Doreen Massey writes,‘A sense of place, an understanding of its character, which can only be constructed by linking that place to places beyond’. All of different spaces are linked as not individual entities but as an interscaler network or continuum to which the individual belongs. With regards to a less obvious connection between an object and mental space, in Britain’s towns and cities the prevalent use and arrangement of CCTV ensures that when a camera is not in our immediate vicinity the silhouette of one is distinguishable or proximate enough to make or leave an impression. This can be habitual enough for the extended presence of CCTV to extend itself so far that it penetrates and becomes part of an individual’s mental space. This is resulting in mental space and law becoming bound to each other. The internet, at two billions users, has the greatest extended presence of any operation in the world and affects our mental space in multiple ways that will be discussed in Section 4. For now it is only a minor point but ironically, it is instant reproduction of image and ability to make things viral that not only has the consequence to threaten Benjamin’s original meaning of aura but it also encourages its disappearance. Place use to comprise of a physical space and the people within it but the omnipresence of CCTV and telecommunications make that no longer true. When reading a space the temporal aspects of a place that Benjamin refers to above as trace also have to be considered. Trace can be recognised as a substitute for the functions performed or that ‘have an effect of making invisible the activity that made it possible’. By interpreting trace the historical trajectory of the place can be revealed. Artist, Steve McQueen, has said that ‘any place is in fact a layering of other places – that is, the place at different points in its history’. This present tense of place as a layering of places in time, can be explained by Paul Shepherd who comments that ‘…archaeology is in process of digging down to expose past in the present […] there is no past or future, only the present […] It all exists with us, in the present, now’. This revelation of history as a single impression is further explained by Benjamin when he describes the past casting its life on the present as ‘…what has been come together in a flash with the now to form a constellation’. Benjamin recognised that for these traces to truly reveal themselves one had to be physically present. To question what a place constitutes, if those who have their attention drawn to it are not physically present, is to question the mode of its representation. From the standpoint of a user, the object through which the internet arrives can be an iPhone, a BlackBerry, a laptop, or a television, etc. Facebook founder ,Mark Zuckerberg, refers to the phone’s ‘homescreen’ as ‘really the soul of your phone’. In reality, the soul of your phone, in Andrew Blum’s words, has ‘a flattening effect on the world’ and is ‘an empty vessel, an absence not a presence’. ‘Connected’ individuals may come to know environments or landscapes through envisioning the specified area as part of a larger entity, for example from a Googlemaps viewpoint and not through a direct experience of the place. Images taken from observation satellites and aerial shots habituate a global view of things. Place has been spatialised through these systems of representation leading the artist Graham Gussin to comment that ‘…the remote viewer seems to invent or project the landscape rather than perceive it. Even for an artist the majority of their world is reached as mediated forms that are literally screened to present the reality for which it is substituting itself. This form of virtual reality creates a panoptical sense of place where each screen image is a single spectacle consumed from a point of privileged invisibility where the viewer becomes Bentham’s officer in the tower. Whilst it is outside the boundaries of this essay to discuss the male or feminine gaze it is likely the gaze focused on a screen depicting a place will be voyeuristic with the look active and the object passive. Should the individual visit a place that has been previously viewed through a screen their response to the place is interpreted through their previous screened experience. The experience of place is of course affected by our experience of getting to that place. Isambard Kingdom Brunel’s Great Eastern took ten days to cross the 2,700 mile stretch of the Atlantic. It is traversable by plane in seven to eight hours or an electronic image can be sent and received from across the pond in an instant. This reduction in time corresponds to the negation of space where time has ceased and space has vanished. Yet, how does duration alter experience of place? Merleau-Ponty wrote that a body can establish in its movement its pass, present and future. ‘Time is, therefore, not a real process, not an actual succession that I am content to record. It arises from my relation to things […] We hold time in its entirety and we are present to ourselves because we are present to the world.’ This intimate connection between body and space defines the duration of experience as being measured against the body moving in space by itself. It relates to Lefebvre’s definition of absolute space by intimately connecting the individual to their space. The further that is strayed from this direct connection the more time will become abstracted until the instant moment of total abstraction is reached. Artist Gordon Cheung wrote that ‘Communication and the digital revolution have collapsed notions of time and distance into the instant, reconfiguring our perceptions of time and space into a state of constant flux’. This moment of the instant has resulted in a contraction of the world to the point where everything can happen to everyone at the same time and everyone knows about it, and therefore participates in everything the minute it happens. This results in multiple places being instantaneously experienced through a screen leading to the reconfiguration of ‘our perception of time and space into a state of constant flux’. The current boundaries of space are becoming less clearly-defined with the increasing number of interscaler networks that form a continuum extending from mental to global space. As places connect to more places beyond defined boundaries become less demarcated. With respect to non-place and the priorities of global capitalism there is a decrease in anthropological place and the identity by which groups of people are known. Non-place is also a defined space but with identities formed by contractual and employer/employee relations. Experience of place is also highly personal. Place is specific with a specific experience to be had and is defined by direct engagement with it and the social relations made. When its activities, fabric, people and the traces of history are experienced in a passive or distracted state the specifics of place are less defined. As iPhones and other devices habitually distract a growing number of individuals it could be said that mental space, and hence the experience of place, is becoming increasingly more affected by their absorbing presence. As discussed, the infringement of personal privacy can also have an additional impact upon an individual’s mental space. Place as a defined space becomes more clearly defined when place is experienced in the present. This present tense can be experienced when there is a direct connection between physical space and that of the on-going immediate present. This includes the traces as a layering of other places as they exist in the present. If space and law are bound to each other than each visible trace reveals that relation. They are traces of a history of a continual abstraction and organisation of space, a history of shifting boundaries and activities and a history of proliferating networks and non-places. Tim Ingold. Being Alive, Essays on knowledge, Movement and Description,http://media.leidenuniv.nl/ legacy/ingold-being-alive.pdf ,p.146. Michel de Certeau. The Practice of Everyday Life (California:University of California Press,1988),p.117. Henri Lefebvre. The Production of Space,trans.by Donald Nicholson-Smith(Oxford:Blackwell Publishers Ltd,1991), p. 193. Maurice Merleau-Ponty. Phenomenology of Perception, trans. by Colin Smith (Paris:Gallimard, 945; repr 2002), p. 284. Yi-FuTuan.Space and Place; the Perspective of Experience. 7th edn. (Minnesota:University of Minnesota, 2011), p.34. PaulShepherd.What is Architecture? An Essay on Landscapes, Buildings and Machines (Cambridge MA: MITPress, 1994), p.114. Marc Augé. Non-Places; an Introduction to Supermodernity, trans. 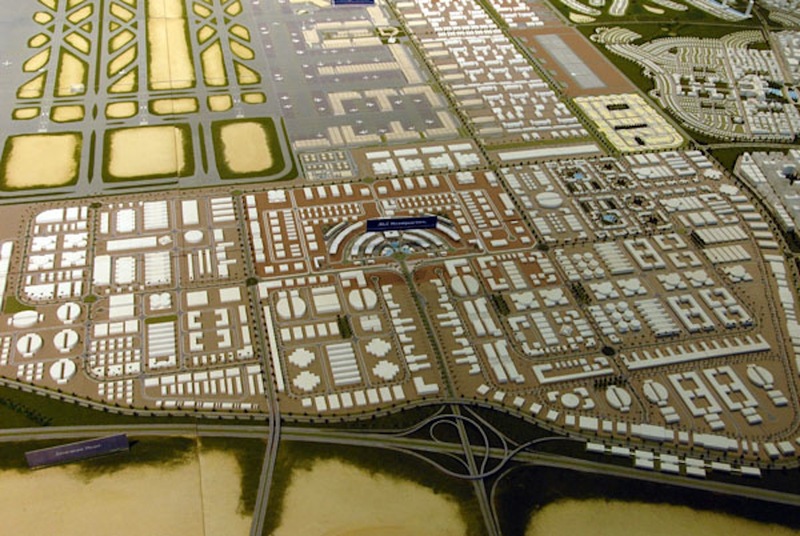 by John Howe London: Verso, 2008), p. 46.
 http://www.uaefreezones.com/fz_dubai_logistics_city.html accessed 30 June 2013. DoreenMassey. ForSpace (London:Sage Publications Ltd, 2005),p.9. 15 Macr Augé, p. 63. Albert Pope. The Unconstructed Subject of the Contemporary City. Slow Space, (New York: Monacelli Press, 1998), pp. 160-178,[excerpt] in Surface Tension Supplement, ed. by Ken Ehrlich (Berlin: Errant bodies), p. 39. (Doreen Massey. For Space (London:Sage Publications Ltd, 2005),p. 152. (Pierre Lavedan, Histoire de l’urabism:Epoque contemporaine (Paris:Henri Laurens, 1952), [excerpt] in Surface Tension Supplement, ed. by Ken Ehrlich and Brandon Labelle (Berlin: Errant bodies), p. 107. Paul Henry Chombart De Lauwe. [excerpt] in Surface Tension Supplement, ed. by Ken Ehrlich and Brandon Labelle (Berlin: Errant bodies), p. 75. Jeremy Bentham, Letter II. Plan for a Penitentiary Inspection House, http://cartome.org/panopticon2.htm, accessed 16 June 2013. Michel Foucault. Discipline and Punish; the Birth of the Prison, trans by Allen Lane (London: Penguin Books Ltd, 1991), p. 143. Robert Morris, Continued Project Altered Daily; The writings of RobertMorris (London: MIT Press, 1995), p. 177. Paul Virilio. Speed and Politics, trans. by Mark Polizzotti (Los Angeles: Semiotexte, 2007), p. 10. (Steve Pile. The Body and the City; Psychoanalysis; Space and Subjectivity (London:Routledge, 1996),p. 91. Walter Benjamin. The Work of art in the Age of Mechanical Reproduction, trans. by J.A. Underwood (London: Penguin Books Ltd, 2008), p. 7. Walter Benjamin. Arcades Project. Benjamin, Walter. The Arcades Project, ed. By Rolf Tiedemann, trans. by Howard Eiland and Kevin, McLaughlin (Cambridge, MA: Havard University Press, 2002), p. 447. Doreen Massey. ‘A Global Sense of Place’(1991), ed. by Claire Doherty, [excerpt] in Situation (Cambridge, MA: MIT Press & London: Whitechapel, 2009), p. 182. Michael de Certeau, p. 97. Tacita Dean and Jeremy Millar. Place (London: Thames and Hudson, 2005), P. 126. Paul Shepherd. The Cultivated Wilderness; Or What is Landscape? (Cambridge MA: MIT Press 1997), p.31. Blum, Andrew.Tubes; Behind the Scenes at the Internet (London: Penguin Books Ltd, 2012). P. 146. Herod, Andrew. Scale (Oxon: Routledge, 2011), p. 26. Tacita Dean and Jeremy Millar, p. 62. Steve Pile. The Body and the City; Psychoanalysis; Space and Subjectivity (London: Routledge, 1996). p. 93. Ahmed, Sara. Queer Phenomenolgy; Orientations, Objects, Others (Durham, NC: Duke University Press, 2006). Augé, Marc. Non-Places; An Introduction to Supermodernity, trans. by John Howe (London: Verso, 2008). Benjamin, Walter. The Arcades Project, ed. By Rolf Tiedemann, trans. by Howard Eiland and Kevin, McLaughlin (Cambridge, MA: Havard University Press, 2002). ——. The Work of art in the Age of Mechanical Reproduction, trans. by J.A. Underwood (London: Penguin Books Ltd, 2008). Blum, Andrew.Tubes; Behind the Scenes at the Internet (London: Penguin Books Ltd, 2012). Dean, Tacita and Millar, Jeremy. Place (London: Thames and Hudson, 2005). De Certeau, Michel. The Practice of Everyday Life (California: University of California Press, 1988). Ehrlich, Ken and Labelle, Brandon. Surface Tension Supplement, (Berlin: Errant bodies, 2006). Farley, Paul, and Symmons Roberts, Michael. Edgelands; Jouneys into Englands True Wildernesses (London: Vintage, 2012). Foucault, Michel. Discipline and Punish; the Birth of the Prison, trans by Allen Lane (London: Penguin Books Ltd, 1991). Herod, Andrew. Scale (Oxon: Routledge, 2011). Lefebvre, Henri. The Production of Space, trans. by Donald Nicholson-Smith (Oxford: Blackwell Publishers Ltd, 1991). Latour, Bruno. On the Cult of the Factish Gods, trans. by Catherine Porter and Heather MacLean (London: Duke University Press, 2010). Massey, Doreen. For Space (London: Sage Publications Ltd, 2005). McDonough, Tom, ed. The Situationists and the City (London: Verso, 2009). Merleau-Ponty, Maurice. Phenomenology of Perception, trans. by Colin Smith (Paris: Gallimard, 945; repr 2002). Pile, Steve. The Body and the City; Psychoanalysis; Space and Subjectivity (London: Routledge, 1996). Shepherd, Paul. The Cultivated Wilderness; Or What is Landscape? (Cambridge MA: MIT Press 1997). ——. What is Architecture? An Essay on Landscapes, Buildings and Machines (Cambridge MA: MIT Press, 1994). Ken Ehrlich and Brandon Labelle Surface Tension Supplement, (Berlin: Errant bodies, 2006). Debord, Guy-Ernest, Introduction to a Critique of Urban Geographyhttp://library.nothingness.org/articles/SI/en/display/2, accessed 12 July 2013. J. Bentham. Plan of the Panapticon (The works of Jeremy Bentham, ed. Bowring, vol IV. 1843, 172-3). Cf.p. 201. Interior of the Penitentiary at Statesville, United States, twentieth century. Cf. p. 250.